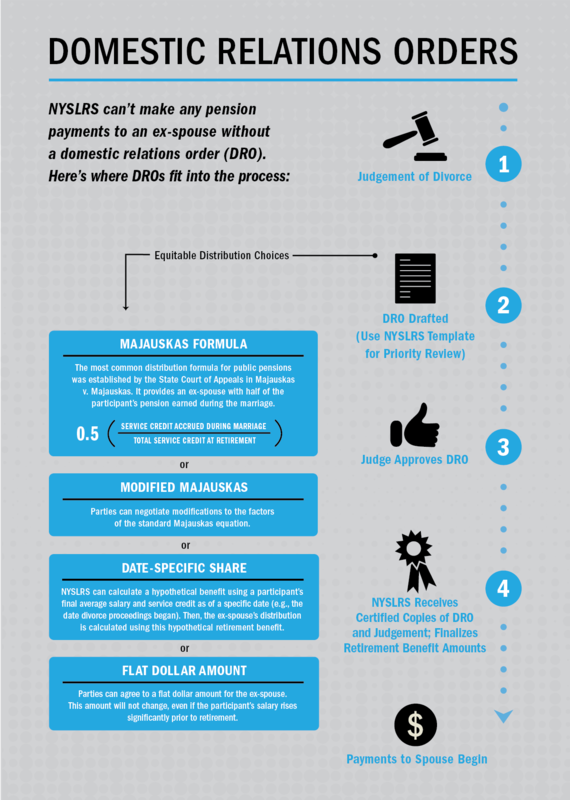 To divide your NYSLRS benefits, we need a domestic relations order (DRO). This court order, issued after a final judgment of divorce, gives us specific instructions on how your benefits should be distributed. NYSLRS provides on online fillable DRO that complies with the plan’s requirements for implementation. You are not required to use the online form; however, the System will give priority review to these DROs since the language is pre-approved. Before we can implement a DRO, a trial court judge must review and sign it, and you need to file it with the appropriate County Clerk’s Office. That can be a lengthy process; our Matrimonial Bureau can check your DRO for compliance with the law before you submit the draft order to the court. This way, if the DRO does not meet the requirements, you will have a chance to make revisions. Once a judge does sign off, we’ll need a certified copy of the DRO and your judgment of divorce. We start payments to your ex-spouse once we’ve calculated and finalized your retirement benefit. If we receive the DRO and judgment before we finalize your retirement benefit, we’ll make retroactive payments back to your date of retirement. Reviewing your beneficiary designations periodically is always important, but after a divorce, it’s essential to make sure your benefits will be distributed according to your wishes. As of July 7, 2008, beneficiary designations for certain benefits are revoked when a divorce, annulment or judicial separation becomes final. Please read our Guide to Domestic Relations Orders and review our DRO FAQs before you finalize your divorce. This last one is not a fact, but it’s a good idea. A lawyer, who’s worked with DROs previously, can help ensure the DRO you submit to the court fairly represents the intentions of both parties. We developed an online template that makes it easier to create a properly formatted DRO. Just enter your tier, plan and employment status, and answer the questions that follow. To submit your proposed DRO for review, email it, along with scanned copies of your judgment of divorce, to our Matrimonial Bureau at dro@osc.state.ny.us. For DRO proposals prepared using our online worksheet, the review process is simplified and we can complete our review faster. If you have any questions about divorce and your benefits, please contact our Hearing Administration and Matrimonial Bureau staff. Content last revised September 19, 2017. This entry was posted in General News, Members, NYSLRS Retirees, Retirees and tagged beneficiary designations, benefits, Divorce, Domestic Relations Order, DRO, ERS, ex-spouse, FAS, Information is the Key, judgment of divorce, know your benefits, members, New York State & Local Retirement System, NYSLRS, NYSLRS Retirees, PFRS, retirement on July 26, 2017 by NYSLRS. You can email our matrimonial bureau at dro@osc.state.ny.us. It has been 6 months since I sent in DRO Forms back in 11/2017. Received a Letter that my matrimonial benefits were approved but needs to be reviewed and signed by the judge. It is now May 2018. How long does a ex spouse have to wait for her court order benefits to start? For questions about a domestic relations order, we suggest you or your legal representative email our Matrimonial Bureau at dro@osc.state.ny.us. You can also email our customer service representatives using our secure email form (see link below). One of our representatives will review your account and respond to your questions. Filling out the secure form allows us to safely contact you about your personal account information.